The movement of the reserve ratio of a banking system does not necessarily serve in all cases as a true index of strength. The ratio may increase as the result of an increase in cash reserve even though the holdings of paper may be non-liquid, or the ratio may decline as the result of the liquidation of credit at a time when the portfolio is in a satisfactory state and when the reserve is sufficient to meet all probable demands of depositors and noteholders. In other words, in estimating the reserve strength the character of the secondary reserve should be considered. The history of the required and actual reserves is shown in Figure 7. The process by which the gold of the country was concentrated in the federal reserve banks during 1917,1918, and 1919 has been described earlier in this chapter. The tide of gold shipments turned against our country during 1919 and 1920, and most of the net exports were taken from the reserve banks. 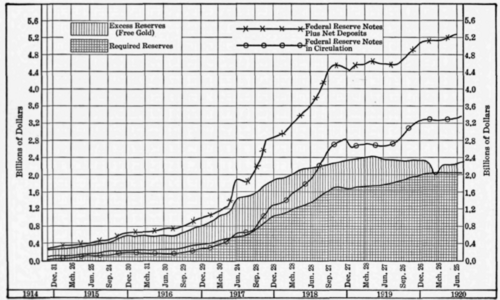 Throughout the period of the war and into 1920 the liabilities of the federal reserve banks for notes and deposits increased quite steadily. Until May, 1919, the accumulation of gold more than supplied the amount of reserve required by law and the volume of excess reserves ("free gold," as it is called) was only slowly diminished. The reserve ratio, however, declined meanwhile, but at a moderate rate. But after May, 1919, the conjunction of rising liabilities and declining reserves caused a rapid decline in the reserve ratio, until in February, 1920, the free gold was wiped out and an actual deficit temporarily existed. This served as a danger sign and the federal reserve authorities became more active in stopping expansion.